Along the freeway Florence-Siena, one wonders what that new and futuristic building, that we find in Bargino village (near San Casciano Val di Pesa), could be. It’s the new Antinori’s winary, the result of an ambitious project strongly wanted by Antinori’s Family, who produces wine from 26 generations and, after five centuries, moves its headquarters from the center of Florence to the heart of “Chianti Classico”.The cellar was built excavating in a hill and then covering the building with the ground. On the roof, for didactic purposes, a vineyard was planted that brings together all the varieties of the Chianti vineyards, even those almost forgotten. Inside the Marchesi Antinori new wine cellar, there are three aisles 75 meters long, where, at a constant temperature of 17 degrees, barriques and barrels rest for a potential production of two and a half million bottles per year. In addition to the winery and bottling area, the building consists of a museum, wine tasting areas, one restaurant, 250-seat auditorium, offices, and one wine store. 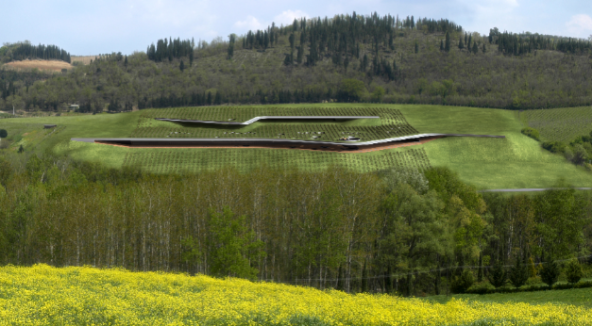 The project of the new winery (that has great respect for the Tuscan environment and landscape) is unique because combines architectural innovations and modern technologies of wine making with the Antinori’s family tradition. Opening is scheduled for February 2013.